Rather than a schedule with pre-set activities, our weeks on the farm are dictated partially by the interests of the campers. Non-negotiable, however, are chores and meals. It’s where we collaborate to accomplish goals, i.e. running the farm and feeding camp, and provides structure to the days. A: Autonomous – We ask the campers all about what is interesting to them and then offer choices, based on these interests. B. Belonging: We welcome kids as they are and work to build community through fun. C. Competence: Kids learn how to do things by doing things that are interesting to them, and led by caring guides who might also be subject experts. 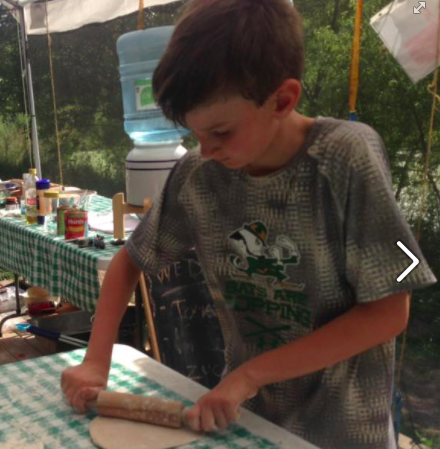 Note: We do our best to include campers in ‘food’ every day, either harvesting, cooking one of the meals, or taking part in a food workshop, e.g. making bread, pesto, pickles, etc. Wednesday is pizza-from-scratch day. Campers are also involved in caring for farm animals each day. Our activity options are often decided through group decision making. All activities are actively supervised (and taught) by at least one staff. We insist one camper’s behavior never take away from another camper’s experience, or endanger oneself or the community. 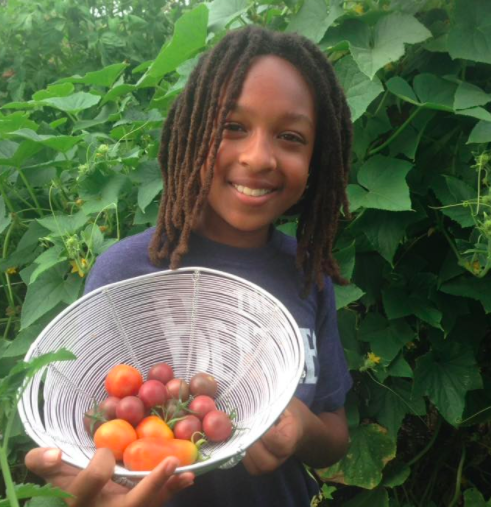 Yes, our camp is centered around food, but the goal isn’t necessarily for kids to become farmers and chefs (although that would be great). 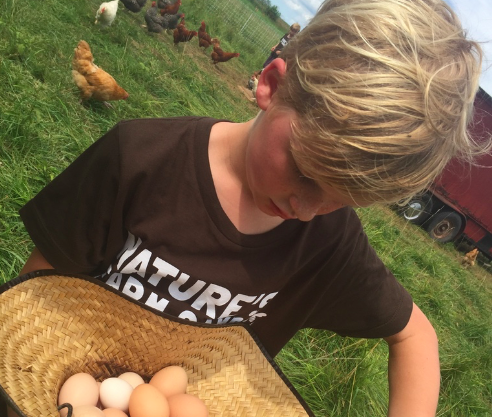 Nature’s Farm Camp is set up intentionally as an environment for kids to flourish. Because the health benefits of swapping screen time for time in nature are overwhelming. So, unless there are emergencies, we are outdoors the entire week of camp – in the woods, fields and stream – and barns and tents. Because the standard American diet causes lots of damage – often, we get in the habit of consuming calories that can barely be defined as food. We aim to develop healthy relationships with food, so campers are involved in all the aspects of what we eat. Through harvests and meal prep with lots of different tastes and textures, kids experience delicious food. 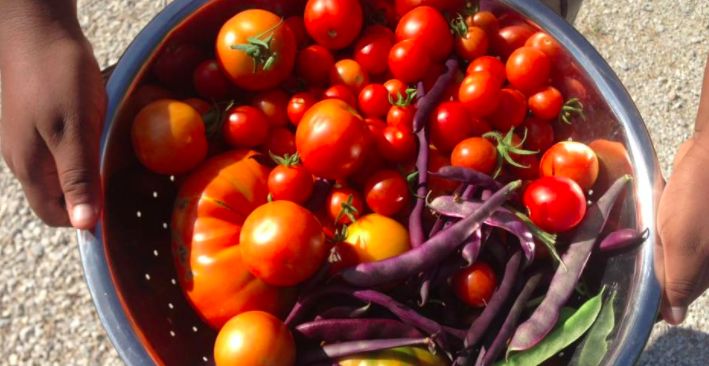 They also meet farmers who grow nutrient dense food that builds health and community. Because the world needs a diverse populace who can work together- dreamers, explorers and inventors who follow their passions and who communicate and collaborate to solve problems. Yet, too often, school and business define success as those who are best at following directions. At camp, kids are given choices and make decisions daily, in a healthy environment with nonjudgemental and caring adults who prioritize safety and fun. Often, we work as teams, including for chores. As members of the community running the farm, campers gain a sense of accomplishment and become part of something bigger than themselves. Because we live in a world of abstraction, it doesn’t matter how many dots you collect. The best way to solve problems is by connecting the dots. Through interactive games, we come to understand the ecosystem and how everything is connected. Campers are encouraged to ask questions and think broadly about how their decisions affect who and what’s around them. Because everyone deserves to belong. So we intentionally build communities that allow both staff and campers to feel safe, and ensure all members of our camp community understand that they have something valuable to contribute. We lead with the Golden Rule and respect all opinions. Because play is not the opposite of work. No matter the age, we all need play. For happiness, but also because learning happens through play. It begins with the attitude of our staff. We build it into the schedule and make it a part of every day. Our aim is to help grow great people. We start each week with high expectations – and we tell the campers as much. Camp’s designed for the kids to grow through doing. To become more resilient, competent and confident, the most effective learning happens through active problem solving. It just so happens that camp takes place in a setting that benefits kids health: days filled with movement immersed in nature. Because going to bed exhausted with a sense of satisfaction feels great. Staff recruitment, training and program development are all done with this in mind. The staff are nonjudgemental and caring adults who prioritize safety and fun. p.s. We’re huge believers in the power of camp to shape lives in positive ways. Even if our camp isn’t a proper fit for your family, we hope your child experiences it somewhere. Let us know if you’re looking for recommendations. p.s. We’re also believe in the power of local food to help change the economy. 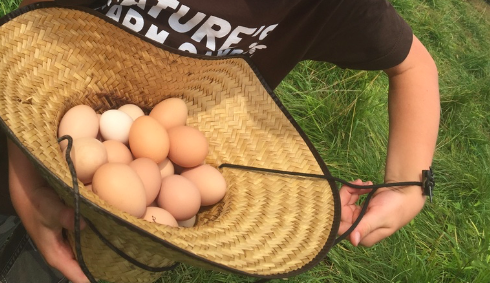 To connect your family with a farm, take a peek at those serving the Chicagoland Foodshed. Deborah, Mike and Sarah, the year-round production farmers and homesteaders at Antiquity Oaks, appreciate seeing all the extra smiles around the farm in July and August. The farmers also love it because they get a partial break from the chores. That’s right. The campers are responsible for helping to keep the operation running. Chores happen twice daily, before breakfast and before dinner. Plus, campers in the Mighty Oaks tent close the chicken coop in the east field at sunset. 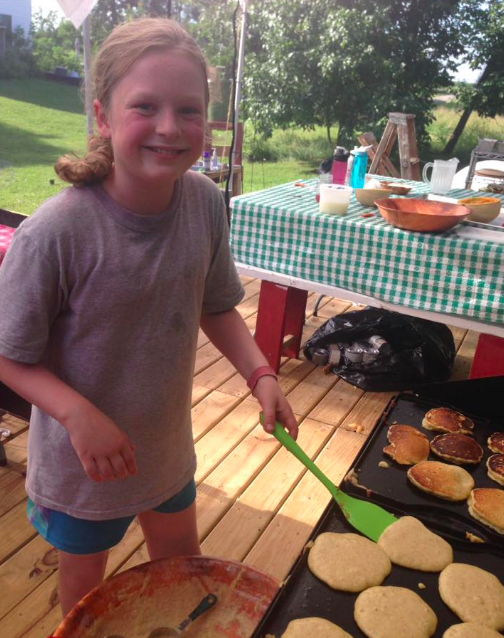 The kids work together with the counselors to accomplish what needs to get done (including the meals, with campers working with the cooking instructors). Inevitably though, routine chores are never routine, e.g. the chickens dump over their water, we can’t find the horse, a goat jumps their fence. We know it’s great when campers problem solve along the way, but it wasn’t until we read this article did we fully comprehend the importance of chores. For 2017, we’re refining and adding programs to maximize the camp experience. One things for sure: chores will continue to be valued. Yes, Nature’s Farm Camp is about fun, but it’s far more than just fun. P.S. If you’re wondering about how this translates to your household and why giving your kids chores can be a win-win, check out this article.